Organisms (plants, animals,and bacteria) that live on or in the sea floor. Familiar examples would be shell fish, crabs, lobsters, sea anemones, sea urchins, sea stars., to flourish. These nutrients support fish, which in turn feed other marine animals and humans. A landmark for early European explorers, in 1602, Bartholomew Gosnold named Cape Cod for the large number of cod he found off the Cape, on a voyage looking for trading opportunities and fishing grounds. This name was one of the things that attracted the Pilgrims to the Cape in 1620. 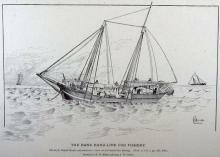 Cape Cod has been the site of many wrecks of coasting schooners.. 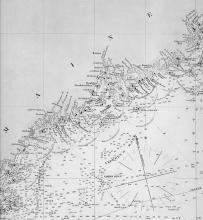 In the Gulf of Maine, smaller banks include Jeffreys Ledge, Platts Bank, Stellwagen Bank, Cashes Ledge, and Fipennies Ledge. 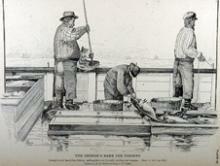 The coast of Maine also offers excellent fishing in its many inlets and around its islands. A sailing vessel of two or more masts, all fore-and-aft rigged. The Thomas W. Lawson, built in 1902, had seven masts. In comparison to a square-rigged vessel of comparable tonnage, a schooner is better for coastwise sailing. regularly made summer trips to the rich fishing areas of the Gulf of St. Lawrence. The shallower waters north of Prince Edward Island and near the Isles de la Madeleine were particularly popular with fishing fleets from Boothbay Harbor and Castine.